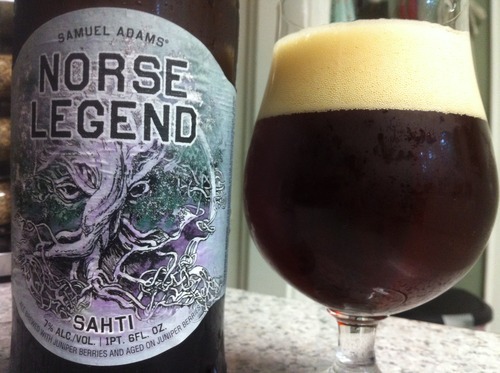 Samuel Adams Norse Legends | Drink. Blog. Repeat. I was sadly underwhelmed with the latest offering in Sam Adams’ Batch No. 1 series of beers and approached Norse Legend – the Boston-based brewery’s attempt at a sahti – with a little more trepidation. Like gose, sahti is a really unique and new (at least to American palates) style of beer, and seeing as how SA’s attempt at the former turned out, I was hesitant about the latter. But no worries here. With Norse Legend, SA’s unique small batch brews are back on track. A quick history lesson: Sahti dates back to 9th century Finland. It’s traditionally brewed with rye and juniper berries. Before metal brewing equipment was created, sahtis were brewed in wooden barrels with hot stones dropped in to heat the mash. (It’s not recommended to put an open flame a wooden barrel.) While Dogfish Head brewed their Sah’tea using that method, I think Sam Adams just went for the modern brewing route. Norse Legend pours a deep amber color. It’s fairly clear but hard to see through. It’s topped with two fingers of a fluffy head that takes a while to settle. Nice lacing and alcohol legs as well. Sahtis are usually very bready and yeasty beers, and that’s very prevelant on the nose. There’s a sweet bready malt note that hits you first. It’s kind of a dark caramel note, which traditionally comes from the caramelization from the hot stones. Juniper berries are very present as well, as are other notes of dark, sweet fruits. The beer has a surprisingly full mouthfeel. There’s a big malt backbone to it that’s covered with hints of plums, dark fruits, brown sugar and juniper. There’s a good bit of carbonation throughout the mouth, which does a nice job of cleansing the palate and making the beer more drinkable. I got kind of an oakiness on the back, which might come from the malt profile. It’s not overly sweet or heavy, and that makes it very easy drinking. Sahti is a style I’m totally new to. Aside from Sah’tea, Norse Legend is only the second beer of the style I’ve tried, but I’ve been pleasantly surprised with both. They’re big sweet, chewy beers. The rich maltiness blends really well with the sweeter dark fruit notes and make Norse Legend and overall really enjoyable beer. Pingback: Dogfish Head Sahtea | Drink. Blog. Repeat.